The skyline problem is pretty popular in coding interviews. Here we take an in depth look at how to solve the problem. Consider the diagram below where there are 4 buildings: B1 (height = 20), B2 (height = 30), B3 (height = 40) and B4 (height = 10). To solve the problem, let us first develop a notation for representing each building and a notation for representing the resulting skyline. Each building can be represented with its left position, right position and its height. So for instance in the diagram, building B1 can be represented as (left = 1, right = 4, height = 20). 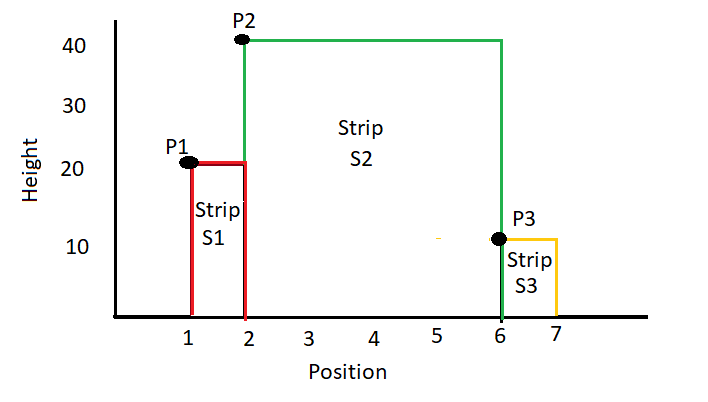 Strip S1 is represented using point P1 (position = 1, height = 20). Strip S2 is represented using point P2 (position = 2, height = 40). Strip S3 is represented using point P3 (position = 6, height = 10). Note that the buildings given to us in the input need not be sorted based on the left position of the building. So for instance, the buildings can be input in the following order: B2, B4, B1, B3. Brute force – In the brute force technique, we first start with a single building and compute the skyline of the first building. Then we go on adding one building at a time and re-compute the result skyline. This is similar to insertion sort. 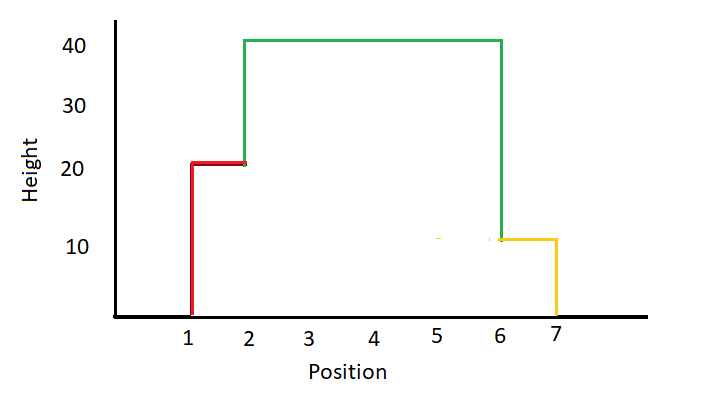 The result skyline will maintain the points in sorted order based on position. Each time we add a building, we have to find where we can insert it in the result skyline. This operation is O(n). Since we have to do this operation for n buildings, the time complexity is O(n2). 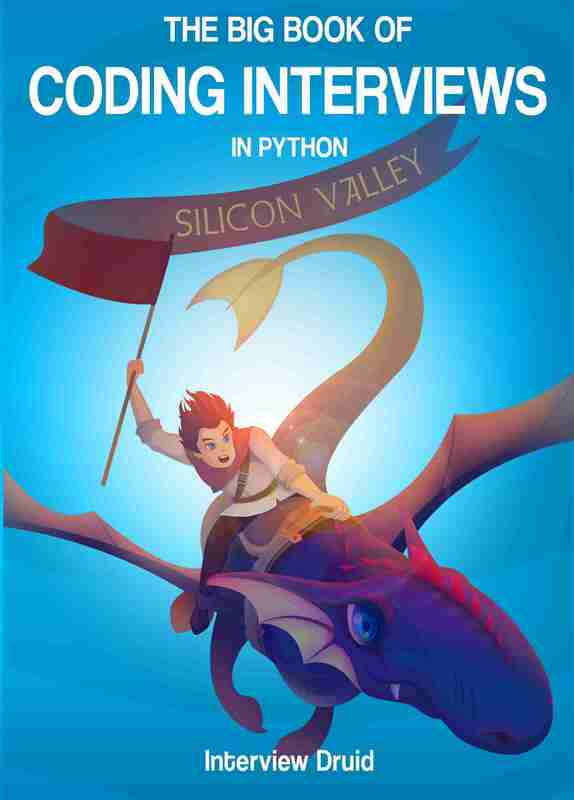 There is a more efficient solution that uses merge sort with time complexity O(nlogn). Given a group of unsorted buildings, we divide the group into two groups: G1 and G2. We then recursively find the skylines for the two groups and then merge the skylines of the two groups to get the result. 1. If the left most point lies in Group-1, then update the height H1 to the height of the left most point. The height of the result skyline at this point is H = max(H1, H2). Let the position of the left most point be P. Append a new point (P, H) to the result skyline. Then advance to the next point in Group-1. 2. If the left most point lies in Group-2, then update the height H2 to the height of the left most point. The height of the result skyline at this point is H = max(H1, H2). Let the position of the left most point be P. Append a new point (P, H) to the result skyline. Then advance to the next point in Group-2. 3. If the left most point in Group-1 is at the same position as the left most point in Group-2, then update H1 to the height of the left most point in Group-1 and H2 to the height of the left most point in Group-2. The height of the result skyline at this point is H = max(H1, H2). Let the position of the left most point be P. Append a new point (P, H) to the result skyline. Then advance to the next point in Group-1 and Group-2. –	We will not maintain redundant strips in the result skyline. So if the height of new point being added to the result skyline is equal to the height of the last point in the result skyline, then there is no need to add the new point to the result skyline. –	There can’t be two points at the same position in the result skyline. So if the position of the new point being added to the result skyline is equal to the position of the last point in the result skyline, then pick maximum height of the new point and old point and store the maximum height at this position. Consider the case where we are merging the skylines of building B1 and B2 to get the skyline R1. At position P1, the height of building B1 is H1 = 20 and height of building B2 is H2 = 0. So max (H1, H2) = 20. So height of result skyline at P1 is 20. 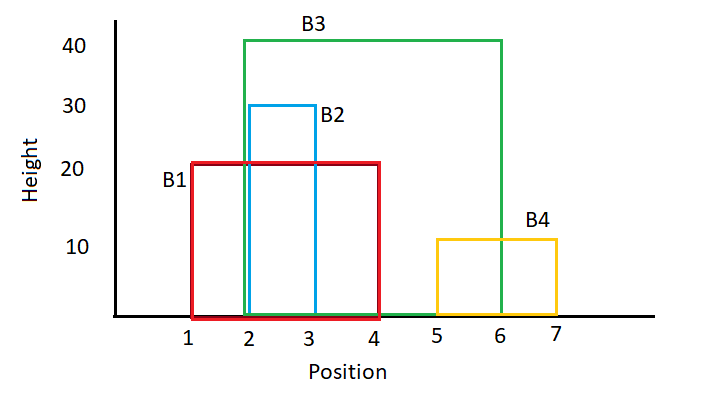 At position P2, the height of B1 is H1 = 20 and height of B2 is H2 = 30. So max(H1, H2) = 30. So height of result skyline at P2 is 30. At position P3, the height of B1 is H1 = 20 and height of B2 is H2 = 0. So max(H1, H2) = 20. So height of result skyline at P3 is 20. At position P4, the height of B1 is H1 = 0 and height of B2 is H2 = 0. So max(H1, H2) = 0. So height of result skyline at P4 is 0. The merging of the skylines B3 and B4 to get the skyline R2 is shown in the diagram below. #Main function for computing the skyline. This function is recursive. #Add the strip corresponding to right end of building to result. /*Main function for computing the skyline. This function is recursive. /*Add the strip corresponding to right end of building to result. Previous ArticleWhat could possibly be wrong with the C declaration char x;?